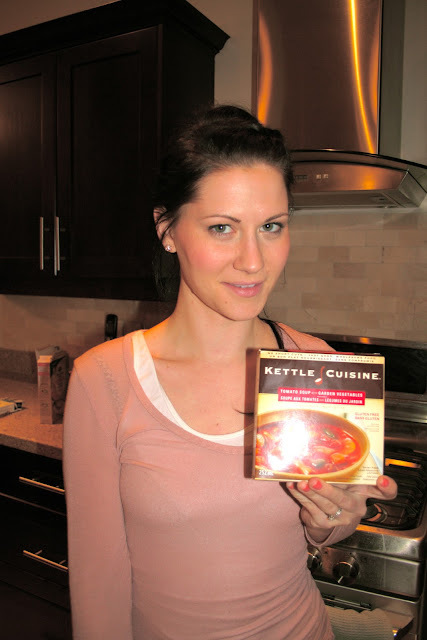 ellehermansen: Gluten-Free Soup from Kettle Cuisine! Wow! I don't recall the last time having proper chicken noodle soup without it being homemade, and let me tell you - this is very close to it! I was utterly surprised to find that the chicken in the gluten free soup from Kettle Cuisine tasted proper quality, while the rice noodles were not left soggy and tasted quite amazing heated up over the stove! I posed above with the "Tomato soup with garden vegetables". Also very tasty! I thought I would write about this gluten-free find, because it was a great one! You can get these soups along with other flavours at Loblaws (and sister companies I believe) You can read more about the company, and other delicious soups they create, here.